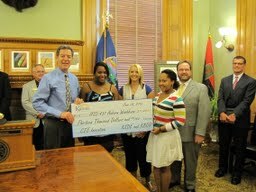 Topeka- Kansas Governor Sam Brownback presented checks during a Tuesday afternoon news conference to representatives from Shawnee Heights-USD 450 and Auburn-Washburn-USD 437, two of the top districts who helped their students succeed in the new Career and Technical Education (CTE) program the Governor authored and signed into law in 2012. The CTE initiative is part of the Governor’s Road Map goal to increase the number of high school graduates who are college and career ready. The program covers the students’ tuition cost for technical courses and rewards school districts with a $1,000 incentive payment for each of their students who earn an industry-recognized technical certificate in a key occupation. An estimated 5,800 junior and senior high school students enrolled in college level technical education courses; generating more than 43,000 credit hours. This is a 50% increase in headcount and 54% increase in college credit hours compared to the previous year. 703 students earned industry-recognized certificates – an increase of 28% then the previous year – in areas like health, construction, manufacturing, and automotive. The state will reward $703,000 to 111 districts for their work in motivating their students to obtain a certificate. Shawnee Heights School District Superintendent Dr. Marty Stessman accepted a $16,000 check from Gov. Brownback. Washburn Rural High School Principal Ed Raines and three WRHS students accepted a $13,000 check from Gov. Brownback on behalf of the Auburn-Washburn School District. 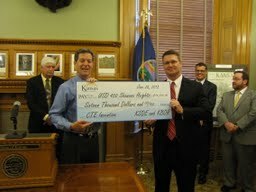 Kansas Commerce Secretary Pat George, Kansas Labor Secretary Lana Gordon, Kansas Board of Regents Vice Chair Fred Logan and Kansas Department of Education CTE Assistant Director Jay Scott also joined the Governor for the check presentations. Governor Brownback will present additional to the top CTE schools districts in the coming months.